Both the Sea Eagles and the Cowboys lost by one point in Round 12 – Manly to the Raiders, North Queensland to the Storm – meaning that this would already have been a pretty tense match without Jake and Tom Trbojevic fulfilling their Blues duties. The game started with Manly points, as a slow peel from Jake Granville and an offside penalty for Shaun Fensom gave Trent Hodkinson the opportunity to boot through the two – a good start for the home crowd at Fortress Brookvale. Nevertheless, the Sea Eagles struggled a bit on the next set, with Daly Cherry-Evans only just cleaning up a floating bomb from Kyle Feldt in the corner, before Brian Kelly lost the football a couple of tackles later. For a moment, Manly regrouped after Jorge Taufua downed Justin O’Neill with the biggest hit of the season since Dean Whare decimated Jeremy Marshall-King. With Jack Gosiewski called offside on the next tackle, the Cowboys got a penalty kick, while Johnathan Thurston orchestrated a dropout on the restart, giving North Queensland a fresh shot at the line. Whether Gosiewski was trying to replicate Taufua’s mammoth effort, or whether he was just frustrated form J.T. levelling the score, he now made the biggest brainsnap of the game – and one that ended with Thurston getting another chance to slot two points through the posts. Well after J.T. had sent the footy across to Ethan Lowe five metres out from the line, Gosiewski slammed in with a late shoulder charge, making no effort to wrap the arms, and finding himself penalised and put on report as a result. It was an early show of desperation from the Sea Eagles, who seemed to lose confidence and focus in the wake of their second-rower’s error of judgement. Their last tackle options, in particular, left a lot to be desired, especially since the wind should have been in their favour. Yet despite a southerly keen to propel the footy further towards the in goal area, DCE’s kicks continually landed short of the try line. The kick chases were just as underwhelming, with only Hodkinson making a serious effort to run down a bomb in the opening fifteen minutes of the match. No surprise, then, that Manly scored their first try before reaching their final tackle, thanks to a pair of good runs from Koroisau and DCE, who poked their noses through the line, and then a gutsy effort from Hodkinson, who dummied to the right, burrowed into the line and offloaded with a swathe of North Queensand jerseys coming in to contain him. From there, Shaun Lane took control of the footy, and twisted and spun through Lachlan Coote, Shaun Fensom and Francis Molo, before landing five metres out from the line and reaching out an arm to ground the footy. Only a player with Lane’s wingspan could have scored in this way, and with Hodko adding the extras the Sea Eagles had showed the Cows that they could score first even without Tom and Jake to steer and organise them. Over the next couple of sets the hosts therefore started to consolidate, due to some good leadership from DCE, Taupau and Koroisau, who forced a penalty from Molo on the fifth tackle a couple of sets later, only for a Hodkinson-Taupau pass to go awry. 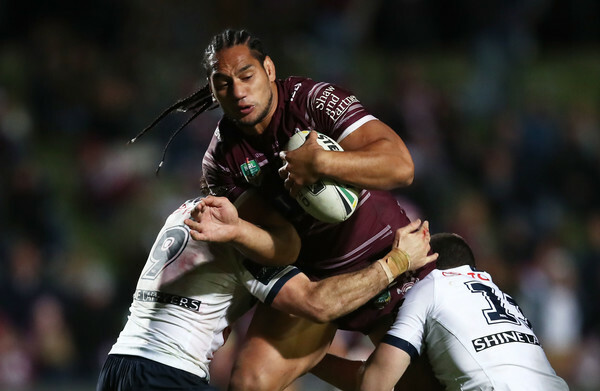 If the Sea Eagles were regathering, however, the Cowboys were also starting to build some momentum, thanks in large part to Thurston, who put in one of his deftest and most intuitive forty minutes of football in several weeks over this opening stanza. A couple of sets later, J.T. grubbered from about fifteen minutes out, and while Taupau might have stuck out a boot to deflect it, he ended up sending it into the chest of Jason Taumalolo, who bombarded the Manly defence before they knew what had happened, to score four points on the night before his twenty-fifth birthday. It was doubly rousing that Taumalolo had crashed over, since the big lock had experienced a few errors of judgement over the game so far, meaning that these four points had an air of consolidation about them. Still, the try was largely down to the dexterity of Thurston, who set up the next four points for North Queensland shortly after, passing the footy to Kane Linnett out on the left edge before dancing around and regathering it. From there, he passed it back behind O’Neill to Coote, before Antonio Winterstein got possession and beat DCE to score in the left corner. While there may have been some controversy about whether Moses Suli had been clipped in defence – even if he hadn’t shown a great deal of energy – the Cowboys got their own disappointment four minutes into the second stanza, when Thurston himself appeared to have scored, only for the try to be called back after a pass from Te Maire Martin was deemed to be forward. In retrospect, and from an aerial angle, that looked like the wrong call – understandable, but still wrong – providing a letoff for the Sea Eagles in turn, who scored on the back of it four minutes later. Once again, the hosts made four points without getting to a last tackle option, sending the football up to the left corner, where Uate, Kelly, Feldt and Martin were all bunched together so tightly when Uate fed the ball to Martin that there were almost no room for Feldt to try and make the tackle on Kelly. In an uncharacteristic defensive misread, Feldt chose to slam through Uate instead of trying to get around him, as if hoping forn an obstruction, but the Bunker made the right call and awarded the try, recognizing that Uate couldn’t simply be expected to vanish at this point. Things got worse for the Sea Eagles moments later, when Brad Parker collected a Thurston kick only to slip over the dead ball line, resulting in a dropout for North Queensland. Still, the visitors had a couple of near misses over the next couple of sets, until another pair of underwhelming last tackle options from Manly gave them the platform they needed to score again. The first was Hodkinson’s decision to grubber straight to Feldt, the second was a Kelly kick that bounced off Tuala, both of which prevented the Sea Eagles from making an inroad on the scoreboard. On the other side of the Steeden, J.T. continued to provide all the leadership that was lacking from the Manly side, putting in a right-left pivot after Kelly’s error to eat some metres up the middle, then making a quick play-the-ball that allowed the Cowboys to rapidly shift the footy out to their left edge before the Sea Eagles could get their defence in order. Granville, Coote and Martin all contributed pitch perfect passes in turn, before O’Neill offloaded under a scramble of maroon jerseys to put Winterstein over for a double. While the mounting southerly might have defied Thurston the conversion, another kick from J.T. set up the next North Queensland try, as a slight touch from Winterstein just after the Steeden left Thurston’s foot saw the Cowboys gain the scrum feed. From there, J.T. 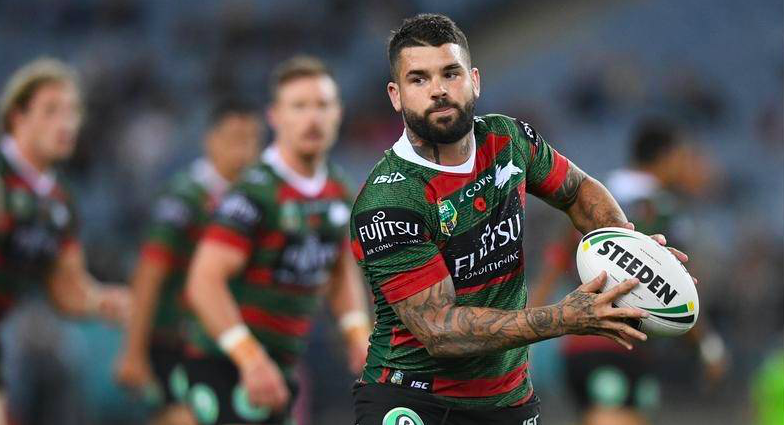 consolidated all his focus and vision of the game so far into a piece of pure poetry – a crossfield kick that Feldt caught on the full and then offloaded to Tuala while spinning under a tackle from Uate with one leg poised on the ground, sending the young centre across for his first try in the NRL. This time, Thurston added the extras, in what turned out to be the last point of the game, which was halted five minutes out for the end after Lane sustained an injury, but was otherwise fairly uneventful as the Cows held onto their fourteen point lead with little drama. They’ll be looking for an equally good win over the Eels, then, when they take them on next weekend in Darwin, while the Sea Eagles will be desperate for a home victory over the Warriors on Saturday afternoon.